•Quartz sleeves solarize, age, etch or break –typically requiring replacement every 2-3 years. •AFPTM840 is a robust, flexible, fracture resistant material. 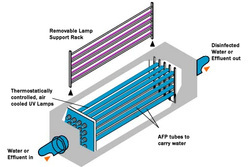 •Flow through UV transparent (AFPTM840) tubes. •Lamps surround flow for improved efficiency. •Lamps in “air” do not need cleaning. •Systems customized for maximum efficiency! •Lamp output is significantly impacted by temperature. •The rapid surface temperature change can result in lamp breakage. •A complete separation of the fluid and lamps in non-contact systems minimises the risk of fluid Mercury or glass contamination. 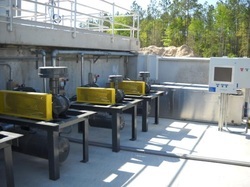 Visit the Enaqua Web site for more information about their products.